*ALERT* <br>Save the state GOP from taking a step backwards! 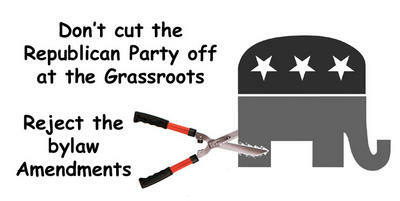 Save the state GOP from taking a step backwards! You know, it's about the time you're really feeling good about the way things are going for your own party, that someone thinks up a foolish way to step backwards into the dark ages of politics. And I hear I'm not the only one unhappy about it. What am I talking about? A notice went out from the South Dakota Republican Party to the State Party Central Committee a day or so ago about some bylaw changes. You would think it's not a huge deal. It happens from time to time to clean up language, tighten up procedures, etc. Except this time. For one of the central committee meetings held during the year- this one held annually in Huron during the State Fair (Sept. 10th this year), the party has just sent out proposed bylaw changes that are going to re-write the party delegate system. In effect, they are proposing to take the system that gave our state conventions tremendous strength and energy with hundreds and hundreds of people attending... And just throw the whole system in the crapper. The County Chairman, Vice Chairman, State Committeeman and State Committeewoman. and 1 precinct committeeman and 1 precinct committeewoman for each precinct. This system, a system which has served the party supremely well for the last 15 years; a system which has had our convention attendance soar to new heights; a system that continues to bring new blood into the party; is going to be thrown out in favor of the way it used to be. 3 at-large delegates, plus another 3 delegates for every 2000 votes that county cast for Governor. What a great way to take the party back to the days of back room deals, smoke filled halls, and complaints about a lack of volunteers. I don't know a soul who wants the conventions to be more "intimate" and have the attendances plummet from a crowd of 800 down to 'a cozy group of 150.' Why would we change the convention from having people by the hundreds, to one that produces the numbers we tease the Democrats about on their convention. Acting as a delegate was the one carrot attached to the job of being a precinct committeeperson. Who is going to want to be one under this proposal? I can hear the enticing words of recruitment for the precinct positions - "Here, you can update this precinct list and do poll watching. But, no, you're not welcome to participate in convention unless you run for it." There is this image out in the public that the Republican party is a party of elitists. A party of power brokers seeking to enrich themselves and their friends. The current delegate system is one of those things which takes those stereotypes and dashes them to the floor. It should not be abandoned because a few people who remember "the way it was" from 30 years ago. We need the participation of "Mr. Everyman", and "Mrs. Everywoman" at the grassroots level. We need those opinions that we don't agree with, and don't always like to hear. In other words, we need to remain as open and participatory as possible. I remember it from 18 years ago, and I also remember it from 15 years ago - and the change made a huge world of difference in the sheer number of people who participated. If you recall, I wrote about it as one of the most brilliant things the state party had done in the last 20 years. Why on earth would we want to turn the clock back on progress? There's a few other changes in these proposed bylaw amendments, such as eliminating the system of 35 legislative district directors sitting on the State GOP Executive board. I don't have a huge problem with that, only if it isn't working. There's also a change proposed for a proxy system, only allowing proxies to go to current members of the board (no non-member substitutions as had been allowed) which I don't care for. But taking the State Party Convention Delegate system back to the early 1980's is a bad move for the South Dakota Republican Party. So here's my plea for those in charge at the state party. Reject this change to the bylaws. Don't take the people who care the most out of the process. Reject this bylaw change, and send it away. Don't cut the Republican Party off at the grassroots. Any Republicans reading this? Please e-mail the state party chairman Randy Frederick at Randy@southdakotagop.com or call the State GOP office at (605) 224-7347 and tell them that this is a bad idea. Tell them we can't afford to be cut off at the grassroots, and that we should not go back to the 'old days'. Better yet, find your county chairman on this list and tell them that we as Republicans need to reject the proposed bylaw amendments. Tell them they need to open that envelope sitting on the table, and actually read what someone's trying to do. And tell them they need to show up at that meeting in Huron on September 10th. When you write or call, please be respectful of the hard work they do. It's often thankless, and they put so much of themselves into it. But be firm. Ask the State GOP and your local Republican county chairman to oppose this measure. Ask them to keep it open and participatory for the people. And that's for the good of ALL the party. Sounds like the country club republicans have a problem with conservatives. This is another example of the republican bureaucrats (RINOs) in Pierre attempting to silence the conservatives of the party. The leadership in Pierre is disconnected from the people and this plan attemps to further disconnect the party from its base. It is time for conservatives to take back our party from the big government liberal powerbroker republicans in Pierre. It happened in Texas about ten years ago and now the republicans there dominate everything. The liberal republicans in Texas howled while the GOP was the minority party in Austin, just like the democrat legislators who hid in Oklahoma last year. The hiding was a result of the conservative take over ten years earlier. Goldwater and Reagan's ideas took over the GOP from the liberals in the 60s and 70s. For the good of the state GOP, its time the conservatives took control of the SD GOP and quit sitting on their hands. My wife was a convention delegate a few years back, and it really energized her interest. She did the poll watching, and all that, and she thought it was worth it. Now, she's so mad she might change her party. Sometimes, I think the people up at the top get so high and mighty that they get a little light headed. And they start thinking stupid. Anonymous – What on earth makes you think that the conservatives haven’t already taken over the republican party? Have you spent anytime in Pierre during the legislative session? They are running the show and them some. Thanks for the H/T on this one. I have posted on my own blog, and have e-mailed to our county committee folks opposing this. DISCLOSURE: Currently a pct. committee person who does NOT feel like being shut out. Is it conservative to add hundreds of new state employees without a whisper? Is it conservative to raise taxes? Is it conservative to spend more than you are taking in? Is it conservative to spend the property tax reduction fund? Is it conservative to allow state employees to retire, start drawing state retirement, and then be rehired by the state the next day? That sounds like an Enron type of scandle to me. Is it conservative to oppose the repeal of the state death tax? Is it conservative to infringe on property rights? Those are the questions that immediately come to mind. Our party has gotten away from its roots, and we have the responsibility to bring it back to its roots! This meeting has been postponed for a few weeks. But the bylaw amendments are still on the table. I'd like to thank GOP for again demonstrating where their true interests lie. Why is there such a gender gap in the GOP? Let's move this discussion on to the front page. Do you comp blog reporters?